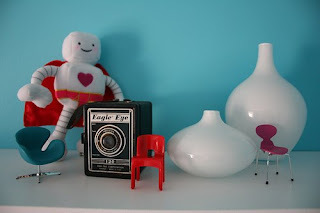 Fantastic article at Martha Stewart site for all of us hoarders of all sorts of bits and bobs. Jennifer Mcguire (one of my favorite stamping designers) has a post here with storage questions and answers in her blog from her readers. Worth a look! I love how Jenn has decorated her drawer set to sort die cut alphabets shapes, here, and the rail system allows her to have at hand paints and tools, here. ... I have received some emails and comments on other websites, I need to make some changes and made things clear in this blog. 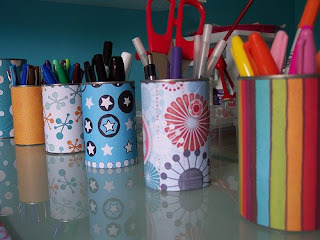 The intention of this blog is to share ideas on how to store craft items (scrapbooking, sewing, stamping...) from crafters. The intention was to post ONLY photos and text sent in by the authors or a friend with the authorization from the author. As it happened, more than once that didn't happen. I posted things thinking I had the permission from the author without having the written consent and therefore got into a little bit of trouble. When I knew I did not have the permission I said so in the blog and commented that if the author had any problems with the link and photos being posted here, they should say so as there wasn't a way to contact them. I also would like to make clear that I never Hot-linked as I always download the photo onto my computer. However, if someone posts something in Youtube they have to assume it can be imbedded in any blog, website that allows Youtube posting. It is not stealing ideas or anything. It is not a thing that is possible with Youtube, it is something that Youtube facilitates, actually I would go further and say that Youtube encourages embeding videos in other websites. Therefore, I assume that if something is in Youtube it is ok to posts as long as I don't receive an email saying the opposite. - have been sent by the author of the idea. - and for all the others ideas just plain old links. Of course that will mean much less entries, less pictures and so on. But I can not spend my time looking for pictures, then asking for permission, witing for it, and if they care to reply then post it. It takes too much time. So, please send your ideas or just pictures of studios. 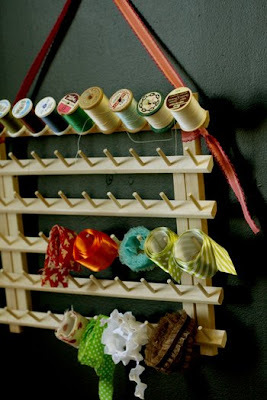 They don't need to be pretty, nor amazing nor huge, just real life crafty storage. Thanks to Renske and Debby for the award. I know it has rules in which I have to link to five more blogs. So just just have fun and go to any five blogs listed here! And it yummy! Click here to see more photos, and here to go the blog of this super talented scrapbooker and cupcake baker. 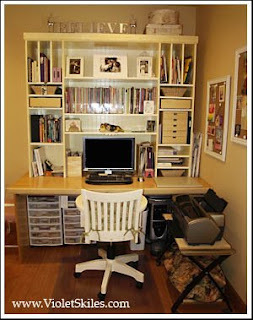 I think is worth to note that it is an small room (for US standards) but it is pack with products and lovely ideas on how to make the most of the space and store all the essentials. PS: I found the video in Youtube, so I have no link to the blog/website of the owner of this studio. Since it had the option of embedding the video I assume it is fine to post it here, but if you are Betty and are not happy about being featured here let me know! You HAVE to check it up here. Jennifer has even done a video tour of it! For the main page of her blog, click here. Lovely cream studio click here more pictures and explanation. For the main page of the blog, click here. This was posted in Two Peas in a Bucket, but since is Youtube I assume it's ok to post it here. 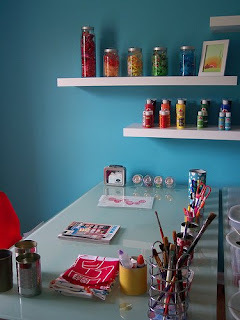 Over at Two Peas in a bucket blog, Cindy posted here loads of photos of her studio. It is worth a visit for all sorts of ideas, as well as Robyn Werlich here. Also, check out this entry at Scrapscene with loads of links here. 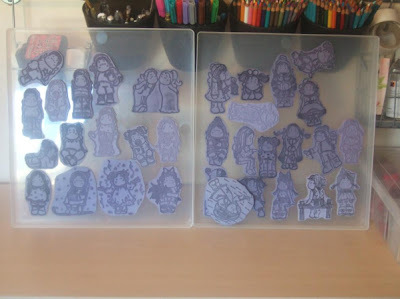 This is the way how Maja stores her unmounted rubber stamps. You can read and see Maja's work here. Click here for more info and pictures on Debbie's ideas. This studios came about because of my love of crafting and art and my concern of how the world is changing around us. I teach classes to all ages bot in my studios and online. I also travel a bit in order to kit. I like to emphasize the power that the scrapbooker really has. We see some many things through are camera that many other people don't see. As it says in my website we have the opportunity to do good with are work. 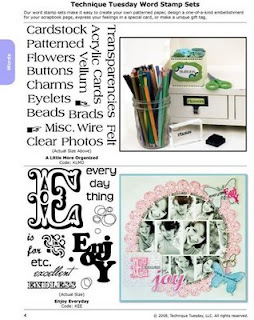 This is what my studio and I are challenging all scrapbookers! We can do it! You can read more about Susan here. 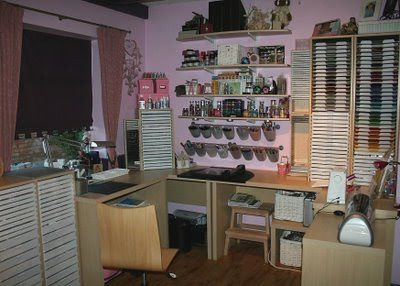 Marlene says that she is really spoilt as she has a lovely craftroom all to herself. The room is just oposite to the lounge so Marlene can just nip in and out when watching the kids, the telly or being on the laptop doing her blogging. You can read more about it here. For the main page of Marlene's blog click here. 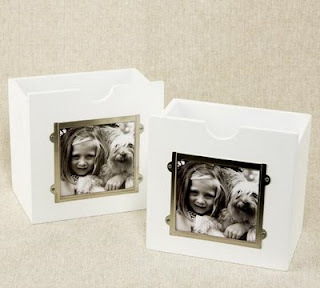 I have just discovered this site, organizedscrapbooks.com, which is has a very similar concept as craftystorage. 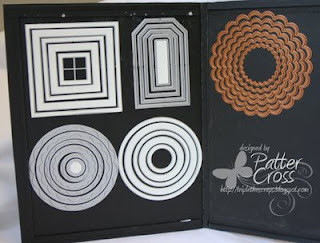 It is fantastic, so I truly recommend to spend some time looking around organizedscrapbooks. Check the planner section here. The only thing is that is not updated very often. Scrapjazz has an E-Book on organizing the scrap space. 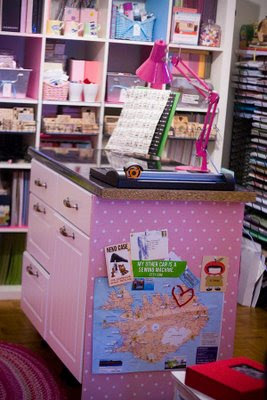 It is quite well written and informative for those who are planning a new craft room. Also, i loved this feature at country living, which has nine photos and some tips, and then this other article is quite interesting as gives ideas on where you can make your mini/super craft room. 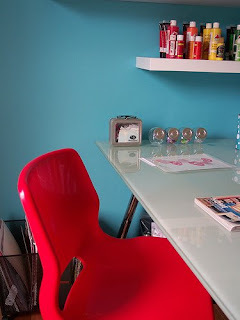 The super talented Rita Weiss has an entry about her studio in her blog. Click here to read about it and here for the main page of her blog. 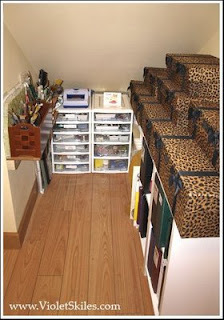 Although I didn't go to CHA, I have research the net for the new crafty storage that different companies have launch. Lets start with Making Memories. This drawers that fit into the Embellishment centre (bellow). For more info click here. 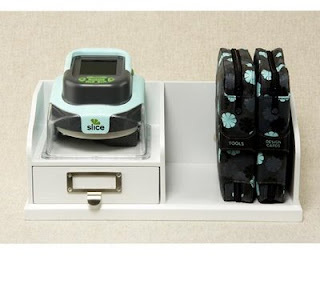 Also, Making Memories have launched the Slice and with it the storage little unit and the cartrige holder bag (the black bags on the right had side). For more info, click here. You can check Technique Tuesday blog here, and their main website here. 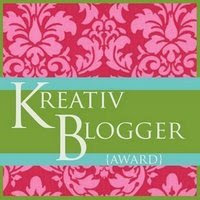 Thanks Louise Edwards who gave this blog the award. Ok, I know that this award has some rules and that I need to pass it on. However as this is not a personal blog, i think it wouldn't be fair to select seven personal blogs. I just invite you to visit all the links that you can see on the right hand side column! 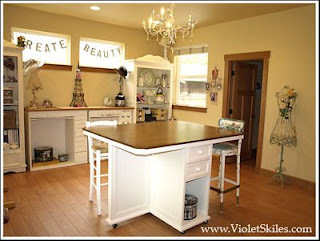 Yvette's studio is one that offers her flexibility which she loves as she can change it when needed it. For more photos click here, to see Yvette's work click here. Laura runs Robson & Mason Haberdashery and she is passionate about everything creative but she believes that she must keep it tidy. She stores buttons in great tubes which you can sew your favorite button on the end. Jam Jars with different things stored inside. Ribbons stacked onto of one another. Mixed Beads stored in glass bowls, for when your hands feel like they need to be dipped in beads. 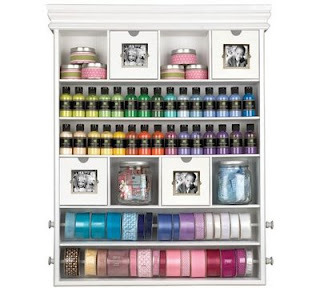 Bead Boxes are great for storing one type of bead. Test Tube stands are great for storing tubes of beads. 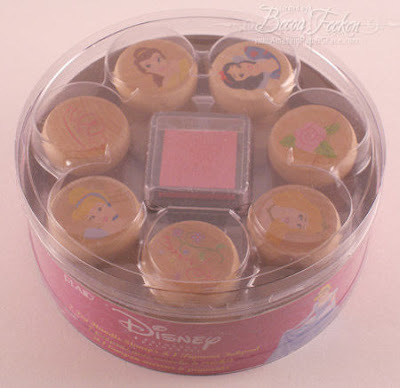 Bobbin boxes keep bobbins neat and untangled. 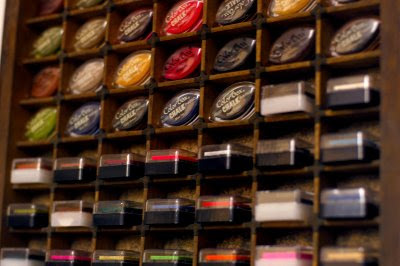 To find more info on Robson & Mason Haberdashery, click here. Kristin Gate doesn't have a large space, just a corner of her bedroom, but she has used every square inch out of it while still maintaining the style that she likes. You can read more about her studio here and check her blog here. My pegboard is probably one of my FAVORITE storage solutions! 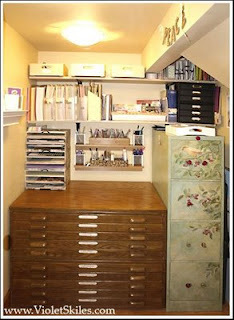 I love having frequently used tools within reach without digging through drawers and cabinets! It's inexpensive too! My pegboard organization looks a little different since the last photos. 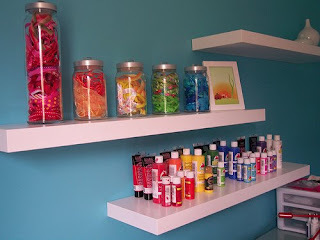 That's one thing about any craft, especially papercrafting ... organizaiton is a huge part of it, especially when new products are purchased. You can access Nancy's blog here. For more store ideas by Nancy, click here. A couple of weeks ago I was cleaning out my linen closet (When you buy new clothes you need to get rid of some too) and I found the two little hangers that were used in stores to hang mens ties on. 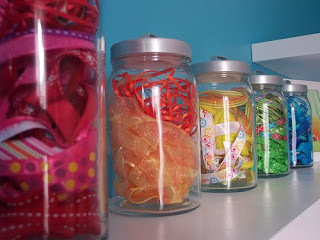 And my brain got working and I had my ribbon storage. here are comparable systems on the market, but this one is FREE! You can see her work and more photos here. Patter uses Quickutz magnetic folders, simple idea but it works great! To see her work and bit of her life here. This is the craft area as seen from Jacqui's kitchen: the craft area is in one corner, the TV is in the opposite corner of the room. 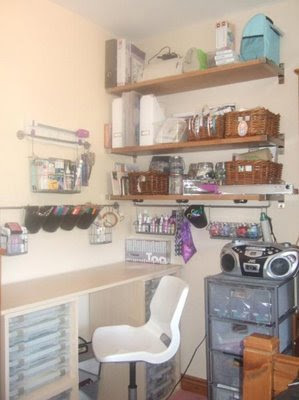 As Jacqui has limited space in her home, her goal was to create a craft area out of existing shared space. 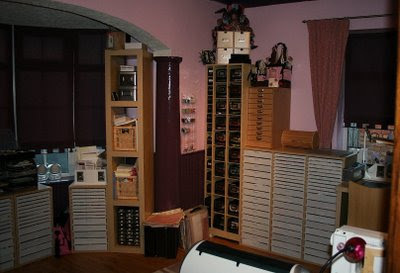 Jacqui already had the sewing cabinet so now she uses for stamping, just had to purchase some shelves and plastic storage drawers. 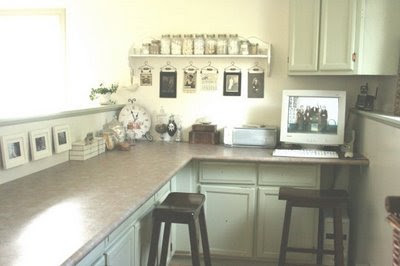 I love this idea, close up of the wall behind where Jacqui seats there is this silver holder which is actually a tray for the kitchen table. 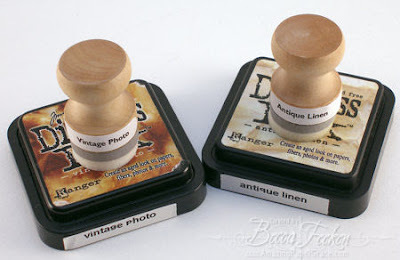 Jacqui has there the background stamps that she uses the most here, as well as a few favorite stamps. 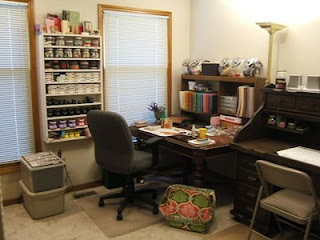 You can see more of Jacqui's Studio area here and if you would like to see her blog, click here. You can see Melissa's work here.